Take that, Jupiter! The largest planet in the solar system just got whacked by an asteroid or a comet, and some intrepid stargazers have captured the planet's latest collision on camera. 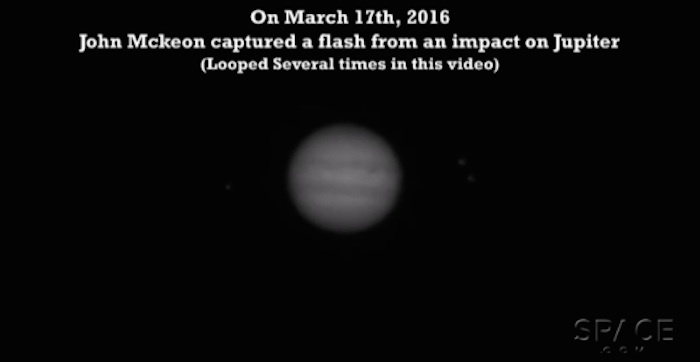 Amateur astronomer John McKeon was observing the king of planets by telescope from Swords, Ireland, on March 17 when he captured this stunning time-lapse video of something hitting Jupiter. McKeon was recording the transit of Jupiter's moons Io and Ganymede with an 11-inch Schmidt-Cassegrain telescope and his ASI120mm camera when something struck Jupiter, and he struck cosmic pay dirt. "The original purpose of the imaging session was to get this time-lapse, with a happy coincidence of the impact in the second, last capture of the night," McKeon wrote in a YouTube video description. While it's still too early to know exact details on the Jupiter crash, NASA asteroid expert Paul Chodas, who heads the agency's Center for Near-Earth Object Studies at the Jet Propulsion Laboratory in Pasadena, California, said there's greater chance that an asteroid, not comet, is the culprit. "It's more likely to be an asteroid simply because there are more of them," Chodas told Space.com by phone. 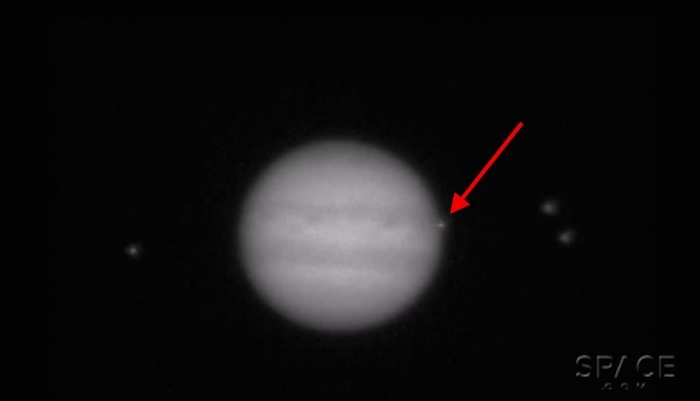 It's not yet clear what hit Jupiter, but the impact was also captured by at least one other amateur astronomer — Gerrit Kernbauer of Mödling, Austria — according to Bad Astronomy's Phil Plait, who posted Kernbauer's YouTube video of the impact. According to Plait, the impact occurred at 00:18 GMT, or just after midnight, on March 17. "The seeing was not the best, so I hesitated to process the videos," he wrote in his video description. "Nevertheless, 10 days later I looked through the videos and I found this strange light spot that appeared for less than one second on the edge of the planetary disc. Thinking back to Shoemaker-Levy 9, my only explanation for this is an asteroid or comet that enters Jupiter's high atmosphere and burned up/explode very fast [sic]." As Kernbauer says, this isn't the first time Jupiter has been walloped by a space rock or comet. "From our point of view this simply serves to remind us that impacts in the solar system are real and Jupiter gets more than its fair share of impacts," said Chodas said. "It draws in a lot of asteroids and comets. 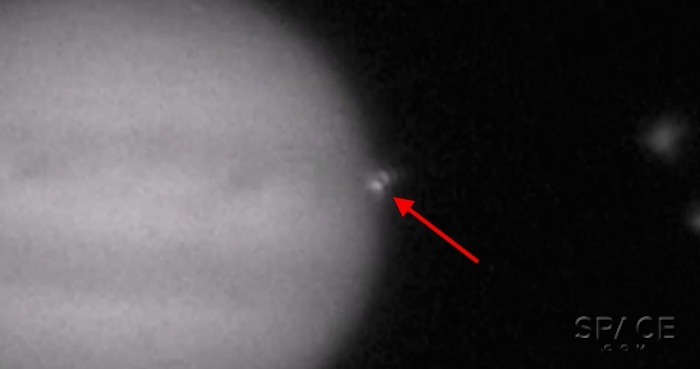 We are seeing these impact flashes on Jupiter about once a year now, and that’s I believe because of instrumentation." 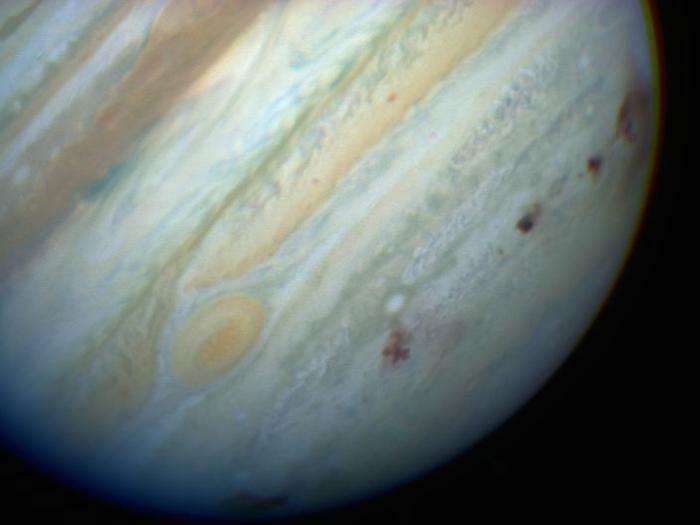 While astronomers watched comet Shoemaker-Levy 9's Jupiter crash from Earth, NASA's Galileo spacecraft — which was en route Jupiter at the time — captured stunning images of the collision. The Hubble Space Telescope recorded views of the impacts in different wavelengths, while NASA used its Deep Space Network to track radio disturbances in Jupiter's radiation belt. Then it happened in again. 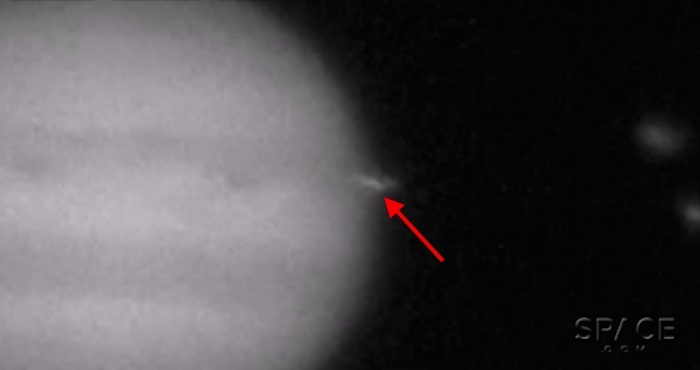 On July 19, 2009, Australian amateur astronomer Anthony Wesley noticed a dark spot near Jupiter's southern pole: the telltale bruise from an impact, likely from a rogue asteroid about 1,600 feet (500 meters) wide. It was roughly the size of the ill-fated Titanic cruise ship. A year later, on June 3, 2010, it happened yet again. This impact was also spotted by Wesley in Australia, as well as by fellow Jupiter-watcher Christopher Go in the Philippines. 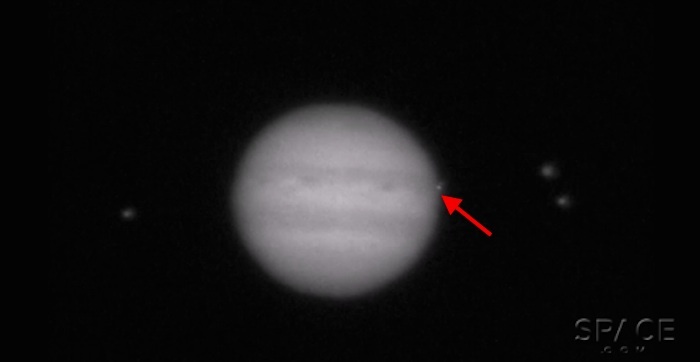 Later in 2010, on Aug. 20, the flash from another impact on Jupiter was spotted by amateur astronomer Masayuki Tachikawa in Japan. Then on Sept. 12, 2012, another flash and crash on Jupiter, this one first spotted by Dan Peterson of Racine, Wisconsin. 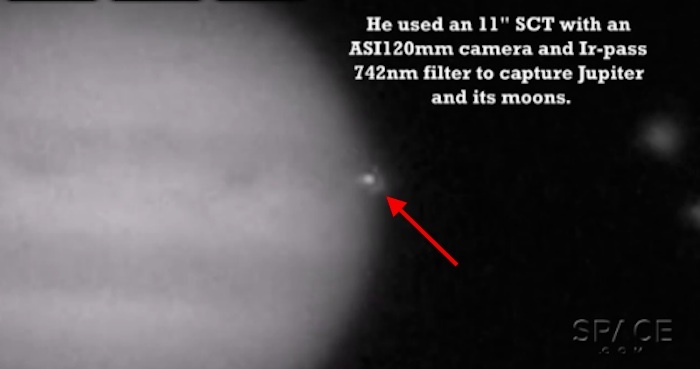 The photos from the recent Jupiter impacts show how the planet is under constant surveillance by some die-hard amateur astronomers. "Better and better instruments means Jupiter is being monitored, even by amateur astronomers, much more than it was in the past," Chodas said. And the planet is about to get another visitor, this one from NASA. On July 4 of this year, NASA's Juno spacecraft will arrive in orbit around Jupiter to pick up where the Galileo mission (which ended in 2003) left off. The $1.1 billion Juno mission launched in 2011 and is expected to spend at least a year mapping Jupiter in amazing detail.